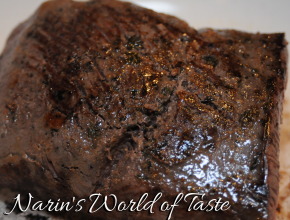 For the Fillet of Beef, season the beef by rubbing in the Italian herbs and salt & pepper with about 2 tbsp of olive oil. Then vacuum seal the fillet of beef with a vacuum sealer at least 4-6 hours before cooking. I often do this the night before. About 3 hours before serving, heat the Sous-Vide cooker to 58 °C. I pour in hot water already, which saves heating time. Once the cooker has reached the temperature, add the beef. It has to be covered completely with water. Meanwhile you can prepare the Mushroom Sauce and side dish (which you can even do a day in advance). 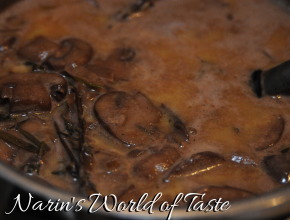 For the Mushroom Sauce, peel the red onion and cloves of garlic, dice the onion thinly and crush the garlic. Clean the brown mushrooms and cut into slices. Once done, heat one table spoon of oil or butter in a pan. Add the red onion and garlic and let them brown slightly. 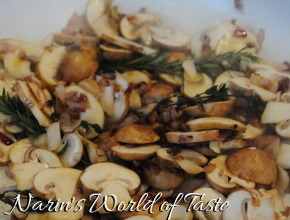 Then add the brown mushrooms and cook them, they should get a nice color. Season with salt & pepper and add the thyme and rosemary stalks, then deglaze with port wine. Add the red wine and let the sauce reduce by half the amount. Then add half of the cream and veal stock and simmer everything for about 20 minutes, pour in the rest of the cream and stock and simmer again, then turn off the heat and set aside. Season to taste with salt & pepper. Just before serving, heat the sauce one more time (you can add a little more cream or veal stock if it has reduced too much). For the side dish, follow the recipe of the Sweet Potato Mash. The fillet of beef is ready after about 2 1/2 hours. 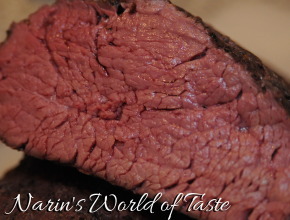 At that time, remove the beef from the vacuum bag and fry each side for about 2 minutes with some oil in a pan. It should be nicely browned outside. Prepare 6 plates, ideally heated so that the food will get to the table as warm as possible. To serve, place the side dish(es) onto the plate. In the picture, I prepared the Sweet Potato Mash and also some oven tomatoes. 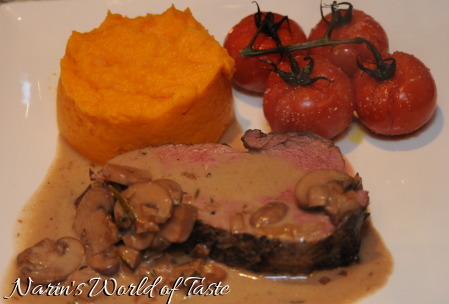 Then cut the fillet of beef into 6 similarly thick pieces and arrange on the plate, add some of the mushroom sauce, and serve immediately.